The Piggyback Principle is a business idea framework that looks at popular market trends or “ecosystems” and seeks ways to support or supplement those trends. It can be a faster way to start a business because you can capitalize on what’s already hot with an additional or complementary product or service. Basically, your side hustle can ride piggyback on a larger business or trend. You could even say that my now-retired shoe-business was a piggyback business on the ecommerce trend and the comparison shopping trend. WordPress is a great example of a “carrier” trend or business. The open source website building platform has spawned thousands of piggyback businesses, ranging from solo freelance development operations, to multi-million dollar software companies and everything in between. Because the WordPress ecosystem has become so gigantic, there’s room for a broad spectrum of support services. For example, WP Curve is a WordPress piggyback business. They offer unlimited 24/7 WordPress support and small website tweaks for $79 per month. They operate completely independently of Automattic, the parent company of WordPress, and are up to $64,000 in monthly recurring revenue. Last year we heard from Ryan Cote on the podcast, who’s built a healthy 4-figure per month side hustle providing SEO services for WordPress sites through his business, WPAmplify.com. And on the software side, we have companies like Optin Monster, BuddyPress, and VelocityPage (from Side Hustle Show guest Jon Nastor) that are all build to enhance the features and functionality of WordPress. What’s next? Could you build a specialty product or service to support WordPress or another growing platform, like Squarespace or Strikingly? Apple is another carrier business to pay attention to, both for physical and digital products. Every time they release a new device, there is a race to create compatible cases, sleeves, and accessories for it. Any company selling iPad cases is a perfect example of a piggyback company. They have their own product, but they didn’t have to do much to create demand for it. They know there’s going to be a built-in customer base, and it’s just a matter of getting in front of those buyers. Because of that, piggyback businesses are lower risk to start than many others. On the software side, Apple has created an entire ecosystem with their App Store. While it can be a tough market to compete in, iPhone apps all piggyback on the popularity of the iPhone. My friend Kurt Elster (from episode 71 on one-page niche sites and productized consulting) recently started a watch strap company specifically targeting Apple Watch owners – another perfect piggyback product. What’s next? Is there a way for you to tap into the Apple (or Android) economy somehow? Another “carrier” trend that’s been hard to miss from the last few years is the paleo diet. If you’re not familiar with it, basically you attempt to eat as your prehistoric ancestors did – with no grains, dairy, or refined sugars. This trend has given rise to piggyback business like the Paleo Plan meal-planning service, Steve Kamb’s Is it Paleo? app, and books like (the other) Pat Flynn’s Paleo Workouts for Dummies. Carrier businesses and trends are easy to spot. In any of the above cases, you already have a “warm” market to sell into. Someone else has already gone through the effort of convincing your potential customer that this is a trend worth paying attention to, and all you have to is create some valuable piggyback product or service to offer up. I’m sure with a little digging and an attentive eye, you can find a carrier trend to piggyback on. 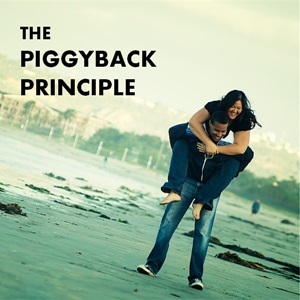 What do you think of The Piggyback Principle?